PORTA MIX Hippo unit. Cement screeds, grout, mortar, texture coatings, sealants, adhesives and many other products can be quickly and effectively mixed without difficulty. Many users have reported a major reduction in physical effort and time when using the Hippo. 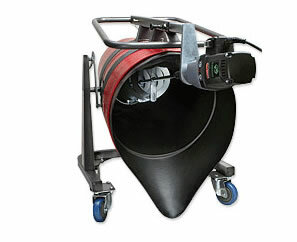 Hippo Mixers easy tilt feature allows contractors to mix, transport and pour materials with unparralled ease. With a mixing capacity of roughly 18 gallons (or 240 lbs), its high torque 16 amp two speed motor makes it a natural for mixing self-leveling materials more productively, while reducing operator fatigue. The Hippo will rewrite the "rules" for mixing these types of flooring systems. Typically, manufacturers' suggest an 800 (or higher) rpm mixer to "cut" the polymer to produce the desired cross-linking. The Hippo's helical mixing paddle with shear bars and its drum shape create a vortex to provide sufficient lifting and shearing action unmatched when mixing these batch sizes. The larger diameter paddle provides increased periphery speed, eliminating any possible flash curing of increased temperatures created by higher rpms. After mixing the first batch, the liner can be removed and cleaned. To speed up production, a second liner can be used while the first liner is being cleaned. The use of a liner also helps to prevent cross contamination and minimizes wear too! Mix, transport and pour directly onto floor. Mix 4 - 5 bags at one time, quickly. Slashes 33% off labour costs.